Super Hero Boy: Bob is in an all new movie!! Bob is in an all new movie!! Bob is becoming a regular movie star these days!! Bob is staring in his own never seen before on TV movie called Bob The Builder Race To The Finish The Movie and we are pretty excited over here. Bob has two new machines Gripper and Grabber, a pretty cool crane and excavator, which starts a bit of a stir in the Can Do Crew.. its always a bit of adjustment when you add some new friends to the crew. In the meantime though they have a stadium to build but can the Can Do Crew adjust to all the changes and still get the stadium done in time? There is a sporting event on the books and there is limited time to get the job done. Bob The Builder Race To The Finish The Movie is a great lesson in responsibility, new friends, and working on a deadline. Connor would have no clue though as he just enjoyed the movie so call it a lesson without even knowing he learned something. heh. Thanks Bob. The great thing though is the fact that unlike the other Bob episodes this is a all new movie that up till now has never been seen before. Pretty cool eh? Honestly enough though one thing I've always loved about HIT Entertainment titles is the fact that usually the bonus episodes are almost as good as the main feature. We absolutely loved the Read Set Race Read-Along I've been working on Connor's baby can read skills and read alongs are always a welcomed edition to this household. Its a bit like a books on dvd format which is always great for building early reading skills. 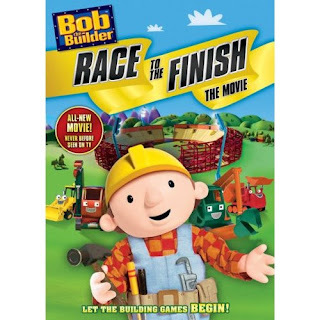 Bob The Builder Race To The Finish The Movie is available right now on DVD and you can pick up yours on Amazon!